Baking at home is pretty much the best. No stress and no one to impress. It's just me and the mixing bowl. There's nothing that goes into my mixing bowl that I don't want to eat. There are no major expectations and no specific requirements. It just has to be a) fun, and b) delicious enough to warrant eating the batter. In my job, I bake every day. The things I bake at work need to look a certain way, taste a certain way and cost a certain amount. At home, the things I bake can be any way I want because, let's be honest... if there is butter, chocolate and sugar, I will probably eat it all. Plus if I want to put $156 worth of Callebaut dark chocolate in there, I just will! Pffffttt. If that cake rises a little lop-sided, I'll just trim it off. If the cookies at the edges of my pan burn a little, I'll just eat those ones. No worries. Small things. 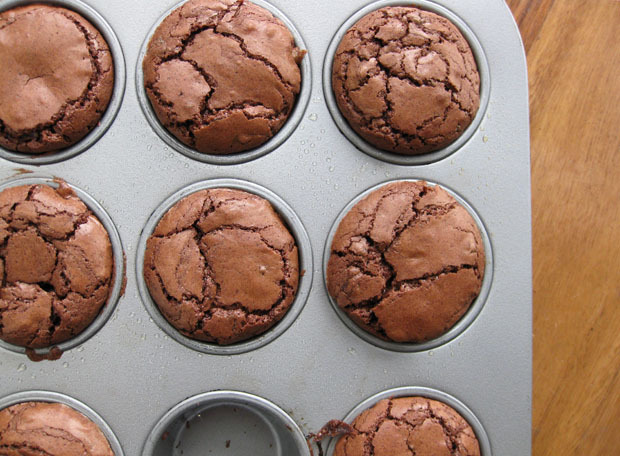 Baking at home is kinda like a sleep over at your grandparents' house. Nonna totally doesn't care if you turn her living room into a fort and hang her bed sheets from the lamp shades. A bowl of ice cream at midnight? Yup! Chocolate sauce....check! That's not to say you can get away with annnyyything when you're baking. Following the recipe is a must....don't change the proportions of important ingredients like flour, sugar or leavening agents. But do change the flavours or add-ins. Almond extract, peppermint, vanilla, black pepper, cinnamon.... White chocolate chunks, walnuts, pecans, dried cherries... Go big! Irregularities will happen and it makes me realize I'm still alive...and screwing up! No pressure. Baking is like playing an instrument except you don't need an instrument. Just read a recipe instead of sheet music. Maybe that's a bit of a stretch, but just make sure not to mix up the sugar and the salt. Bad. Seriously....really gross. These little bombs of oh-my-holy-pants-I-needed-that are entirely chocolatey and spiked with almond extract to give them a warmer flavour.... almond extract reminds me of Winter. As you can see, they are also fabulously shiny and crackly-topped. To make them the best they can be, use the best dark chocolate that you can find. A bitter, roasty, intensely dark chocolate with 70% or more cocoa solids is what I want you to get your paws on. Same goes for the cocoa powder - use a natural one if you can find it. Natural cocoa has a much more intense chocolate flavour because it has not been processed by alkalization, a technique known as Dutch-processing. Don't be fooled by the colour, though, because natural cocoa appears much lighter compared to dark, reddish Dutched cocoa. Hershey's is a great example of natural unsweetened cocoa - it's much easier to find in the US compared to Canada. So today, how about you drop a bomb on your friends the nice way. Don't tell them that your "job" as a burlesque housemaid is actually a cover for your real job as an international bounty hunter. Just give them one of these brownies and consider it done. Preheat your oven to 350°F. 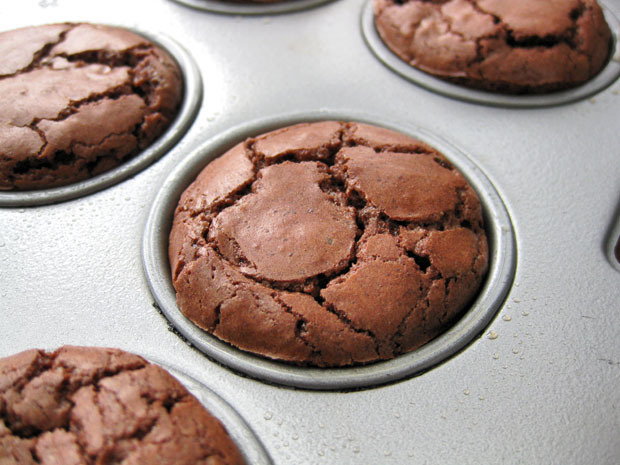 Spray the cups of a 24-cup mini muffin pan with cooking spray and set aside. In a small bowl, stir together flour, cocoa powder and finely chopped dark chocolate with a fork to evenly blend and break up the cocoa lumps; set aside. Meanwhile, whisk together eggs, sugar, almond extract and salt in a medium bowl until pale and thick. This will take about 1 minute. Add warm chocolate mixture and stir it in using a rubber spatula until evenly blended. Add flour mixture and stir gently until well incorporated and batter is smooth. Spoon about 1 ½ tablespoons of batter into the wells of your prepared muffin pan and bake until shiny and cracked on top, about 8-10 minutes. Transfer pan to a wire rack and let cool for about 10 minutes. 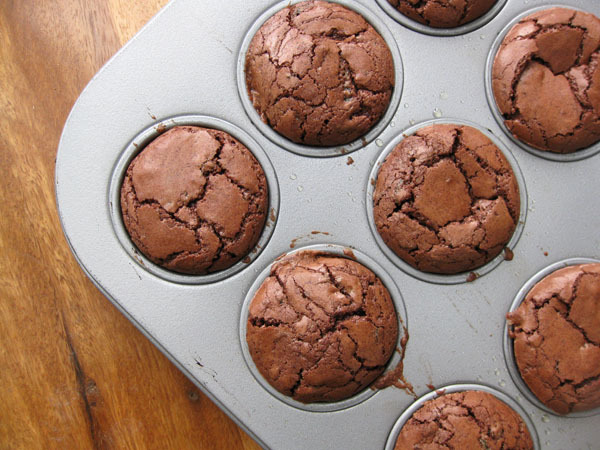 Run a knife around the edges of the brownie bombs to release them and knock yourself out! I love how they are cracked on top. These look amazing! Can I put just 50gr of brown sugar? Hi Maja, 50g of sugar will not be nearly enough to create the moist texture for these brownies. They would be very dry. You could reduce to maybe 150g. Do these freeze well? How far in advance can you make them? Thanks! May I know what % of cocoa solids is in the bittersweet chocolate you used? These look divine and perfect for parties!